At least 59 women advanced to the general election after Tuesday's primary races, according to election data. In a year where women are seeking elected office in historic numbers, at least 59 female candidates — most of them Democrats — cleared their primary election hurdles Tuesday night, results compiled by NBC News and The Associated Press show. Two more women advanced to run-off races, while four others are leading in contests that haven't yet been called by either outlet on the biggest primary election night of 2018 to date. The winners were among 117 running for statewide and federal office in Tuesday's eight primary states, according to the list compiled by Rutgers University's Center for American Women and Politics (CAWP). At least 34 women lost, while another 18 are trailing in contests in California that have not yet been called. More than 500 women — the majority of them Democrats, as well — are running for statewide or federal office nationwide, according to the Center for American Women and Politics, blowing previous records out of the water. Some of the women will make history if they're elected in November's general elections. 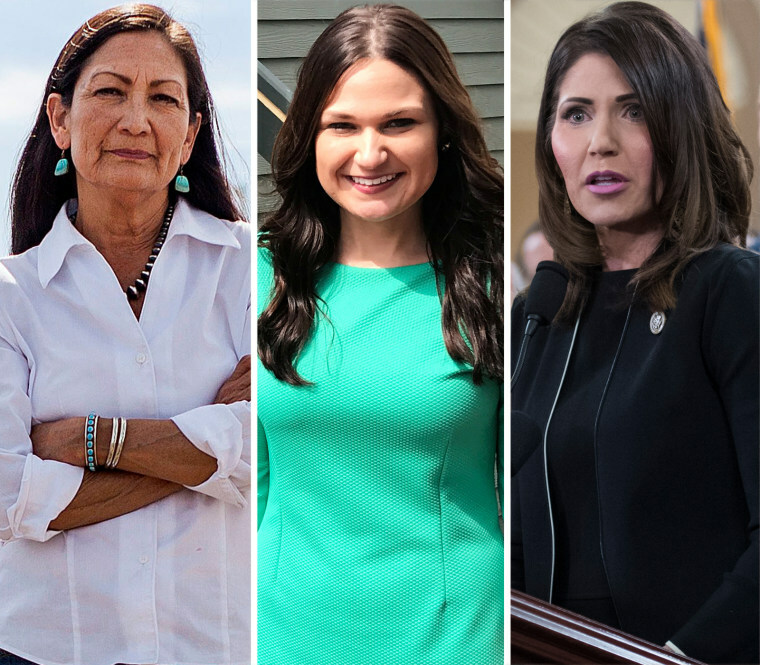 In New Mexico’s 1st Congressional District, Democratic primary winner Deb Haaland would become the first Native American woman in Congress if she wins the open seat vacated by Michelle Lujan Grisham, who won the state's Democratic primary for governor. Grisham could be the nation's first Latina Democratic governor if she wins the seat vacated by the nation’s first Latina Republican governor, Susana Martinez, who is term limited. Grisham was one of four female candidates who advanced Tuesday in governor primaries: Incumbents Kay Ivey of Alabama and Kim Reynolds of Iowa won their Republican primaries, while Rep. Kristi Noem of South Dakota became the first woman to be nominated for governor in her state after winning the Republican primary Tuesday night. The number of women running for governor nationwide also smashed the previous record: According to CAWP, 73 women are expected to appear on ballots this year, more than doubling the high of 34 in 1994. The open seat for New Mexico’s 2nd Congressional District is expected to be competitive, but either way, the voters are going to send a woman to Washington: Xochitl Torres Small won the Democratic primary, while Yvette Herrell won the Republican contest. In Iowa’s 1st Congressional District, Abby Finkenauer, 28, won the Democratic primary to challenge the Republican incumbent, Rod Blum. If elected, Finkenauer would be the nation’s youngest representative, according to the Associated Press. Female candidates did fall short in some races, however. In California, none of the women running for governor in California's crowded "jungle" primary — where the top two finishers advance to the general election regardless of party — managed to garner more than 3 percent of the vote.